The most financially successful American independent movie of 2008 didn’t premiere at Sundance, didn’t earn any Academy Award nominations, and didn’t amass honorable mentions on dozens of Ten Best lists. But none of that really mattered: Fireproof – the latest small-budget act of faith by Sherwood Pictures, an indie production company operated by pastors Alex and Stephen Kendrick of the Sherwood Church in Albany, Ga. – grossed $33 million without ever playing in more than 1,000 U.S. theaters at the same time. To put that figure in context: It’s more than the combined gross of the critically acclaimed, Oscar-nominated indies Frozen River, The Visitor, In Bruges and Rachel Getting Married. What makes this surprise success story all the more extraordinary is that, much like Flywheel (2003) and Facing the Giants (2006), two previous Sherwood productions, Fireproof is a faith-based drama made with a mostly volunteer cast and crew, aimed squarely, but by no means exclusively, at moviegoers who value churchgoing over trend-spotting. Former teen idol and sitcom star Kirk Cameron (Growing Pains) gives a genuinely compelling lead performance as Caleb, a work-obsessed firefighter on the verge of divorce from his neglected wife. Can this marriage be saved? Only if Caleb takes the advice of his born-again father and commits to "The Love Dare" -- not a TV game show, as its name might imply, but a 40-day, Bible-inspired program designed to help spouses restore frayed ties. 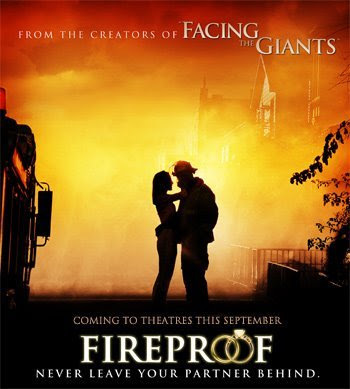 Cameron, an evangelical Christian who also has starred in movies based on the Rapture-themed Left Behind novels, remains eager to spread the good word about Fireproof. Just in time for this week’s release of the movie on home video, he recently answered a few burning questions about the improbably hot property. My interview is here. I am having a movie party with some friends of the "Fireproof" movie. Is it okay if I use the picture for creating the event invitation?